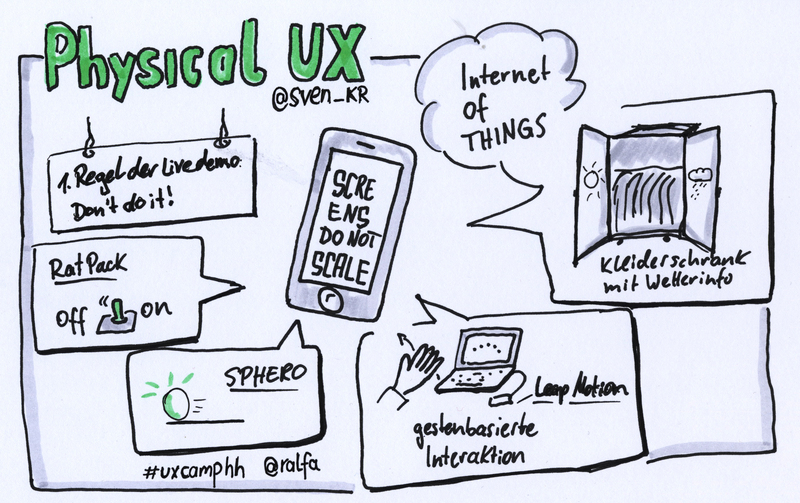 Sketchnotes zur Session „Physical UX hits the consumer market – now what are we going to do with it?“ von Sven Kräuter @sven_kr beim UX Camp Hamburg 2013. Eine größere Version des Bildes gibt es auf flickr. Physical interaction with electronic devices not only left the maker spaces and went pro. It already hit the mass market. From Internet of Things with products like Berg Little Printer to the Intranet Of Things with Leap Motion, Sphero and Tile we are seeing a rising number of new form of interaction with our online and offline devices. Besides the representation of data in physical objects there’s also a new wave of data input devices. We’ll discuss examples and of course will have some on site experience with one device or the other. What are the opportunities & challenges that we face from a UX perspective? Are we going to make the same mistakes that were made transitioning from print to online? Let’s have a look.